I had the privilege of being able to watch the highly successful Quinn Martin production of The Fugitive during my teen years (63-67) on prime time television. David Janssen, starring as Dr. Richard Kimble, was one of the more recognizable actors in Hollywood as he searched for the one-armed man while being pursued by the relentless Lt. Gerard, played by Barry Morse, with the distinct voice of William Conrad in the background as the narrator. My first experience with Pete Rugolo was a Mercury album “Rugolo plays Kenton,” a nice jazzy big band lp featuring Shelly Manne, Bud Shank, and Milt Bernhart performing many of the Kenton standards. Pete spent a lot of time in the 60’s and 70’s composing for television doing shows such as Run For Your Life, Thriller, and Leave It to Beaver, but it is the memorable jazz theme from The Fugitive that he’ll be remembered for. This Silva recording of the original score with the London Studio Symphony Orchestra conducted by Harry Rabinowitz is the available recording and from what I can remember from what I heard while watching the series a good job duplicating the actual soundtrack cues in the Rugolo style. I think the confusing part for me was the combining of cues and the use of other composers such as Herrmann and Goldsmith being put into the mix. 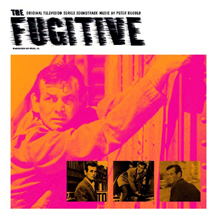 One word of caution is you must like The Fugitive theme as it appears in the majority of the 24 tracks. If there was a situation Pete figured out a way to use it. Strings, harmony, sax, brass, woodwinds, music on the road or on the run, loud or tension, action or romantic, sharp staccato, it was done. “Lt. Gerard” is a dark somewhat ominous musical description of the arch enemy of Kimble. The loud dissonant brass is followed by the grief stricken oboe. After a brief main theme statement “Train Wreck” turns loose the brass in loud exchanges featuring descending crashing scales at the end of the piece. Lower plodding from the woodwinds build up to a crescendo from the sharp brass statements ending with “The Fugitive” theme. Kenton style harmonic chords are featured around “The Fugitive” theme in many different combinations in “Brass Interlude.” This cue really took me back to the big band style of Stan Kenton who featured a lot of brass. If you like the theme and the series you’ll enjoy this trip back into memory lane for 47 minutes.